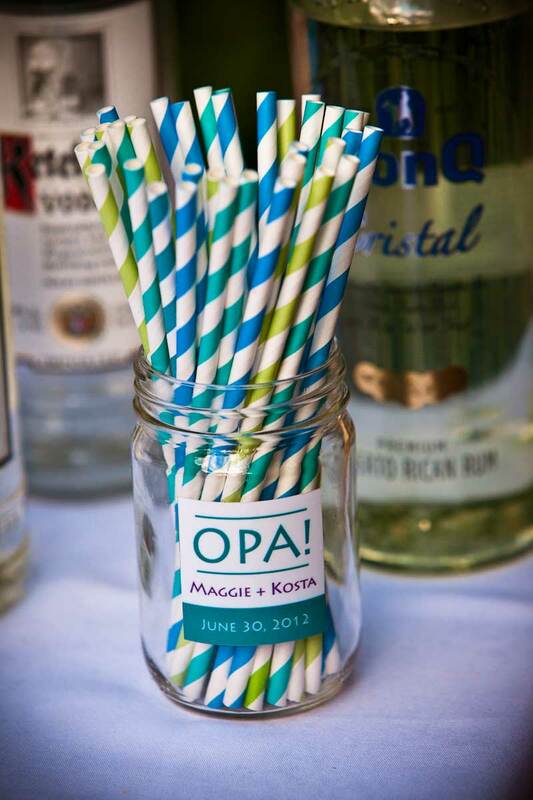 Real Wedding~Maggie and Kosta, the Reception! 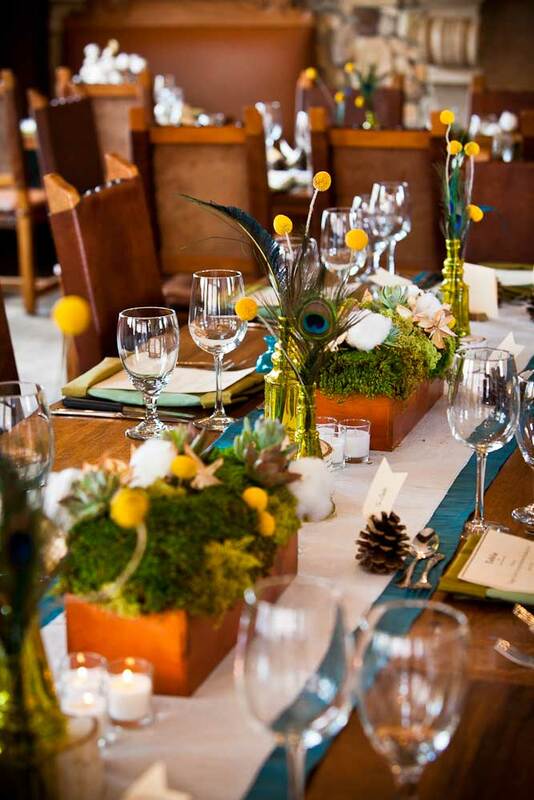 The reception took place in the very beautiful Tabla Restaurant at the Hotel St. Francis. I love this space because it offers a very clean and sophisticated canvas on which to design. 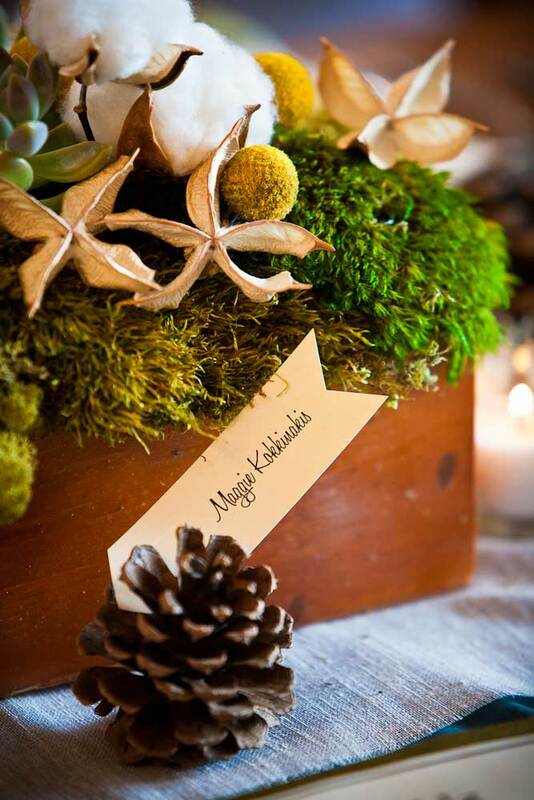 Maggie loved materials like peacock feather, pods, pine cones, moss and succulents. 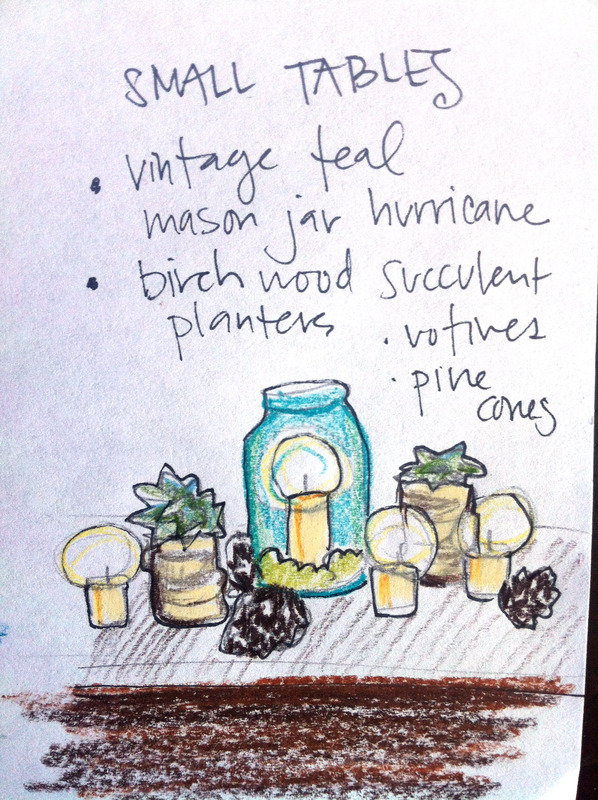 Luckily the arsenal within my studio had everything she needed, like vintage teal mason jars and birch stump planters (not to mention my succulent farm). But the best thing for me was receiving two giant bushels of dried cotton from her father’s farm! 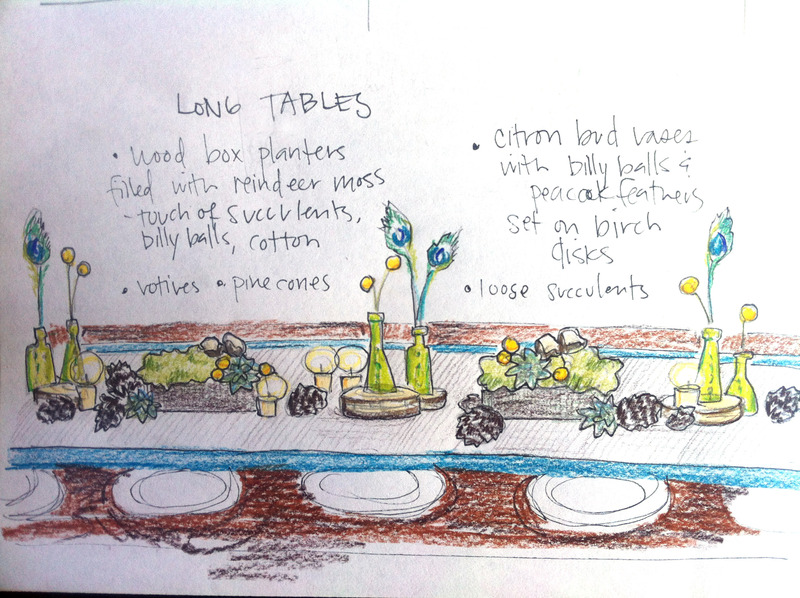 I worked those into the design of the tables and wow, was it stunning. 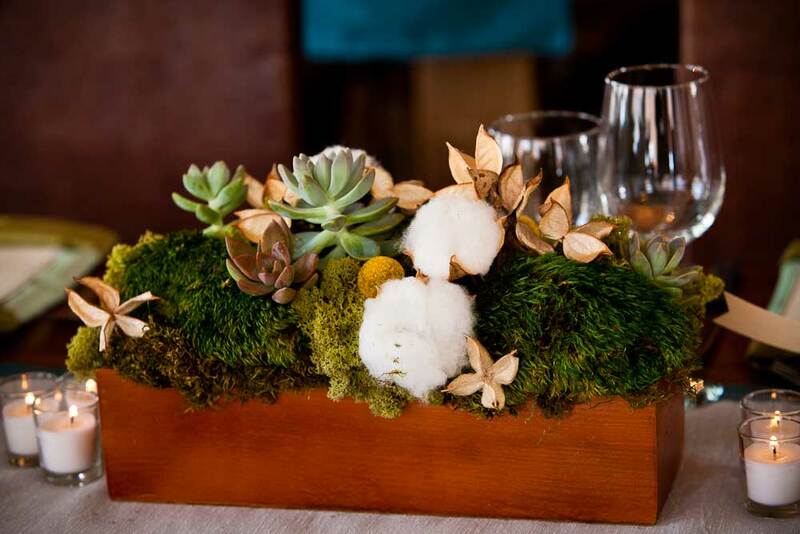 It completed the look in addition to being a very sentimental part of the wedding. 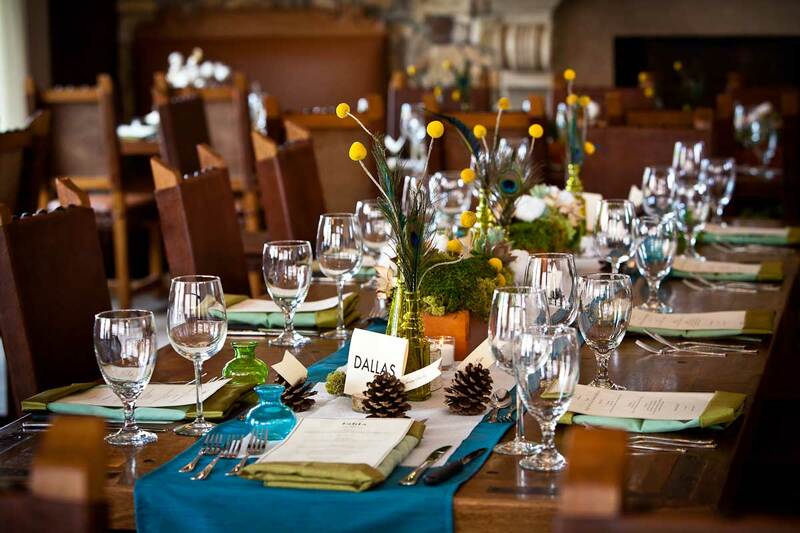 I created custom table runners with fabric from Santa Fe Fabrics. 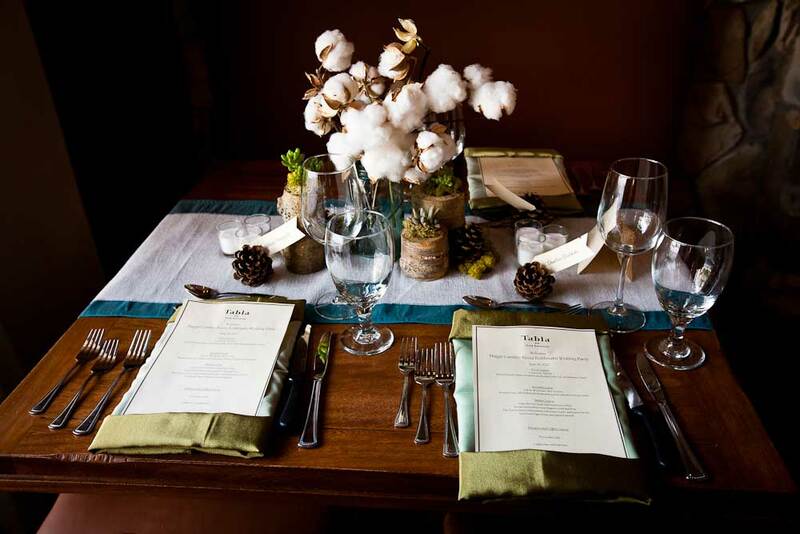 We wanted to keep Tabla’s beautiful wood tables exposed, but bring in a touch of teal, while at the same time keep it rustic with a frayed edge linen. 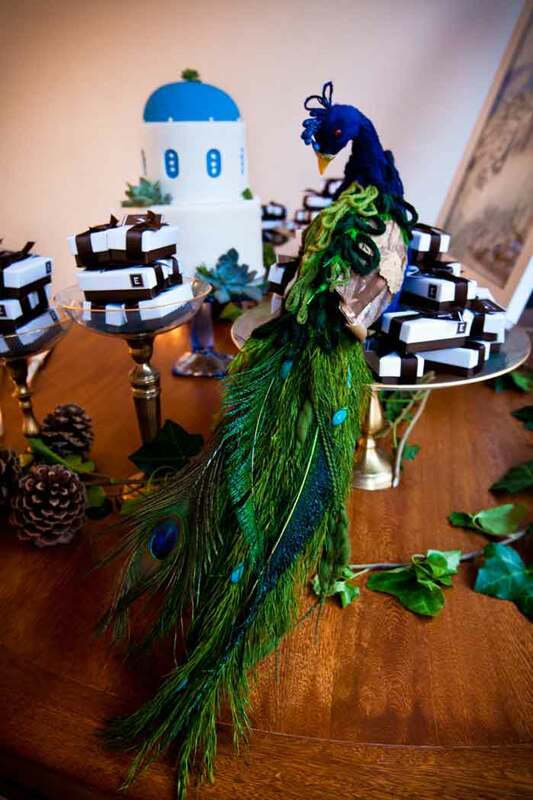 Then, there was cake. 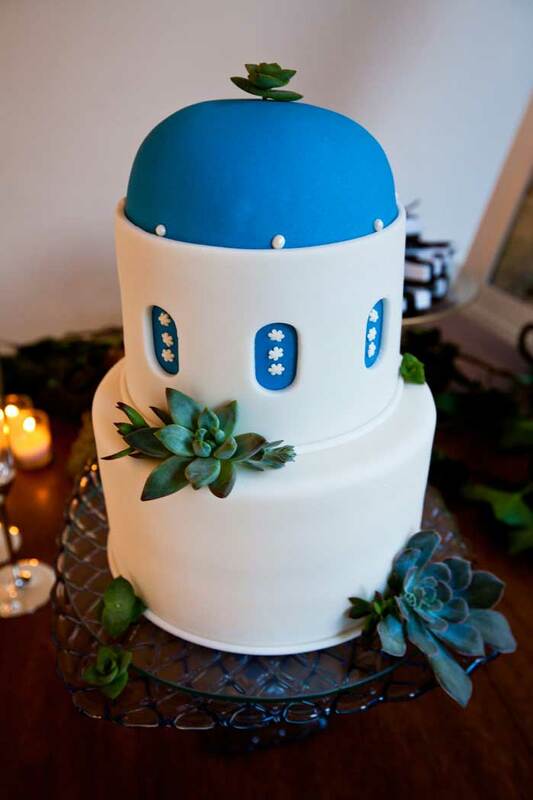 Now this wasn’t just any cake, it was a fine Maggie’s Wedding Cakesexquisite creation, shaped like a church in Santorini! Oh, snap! 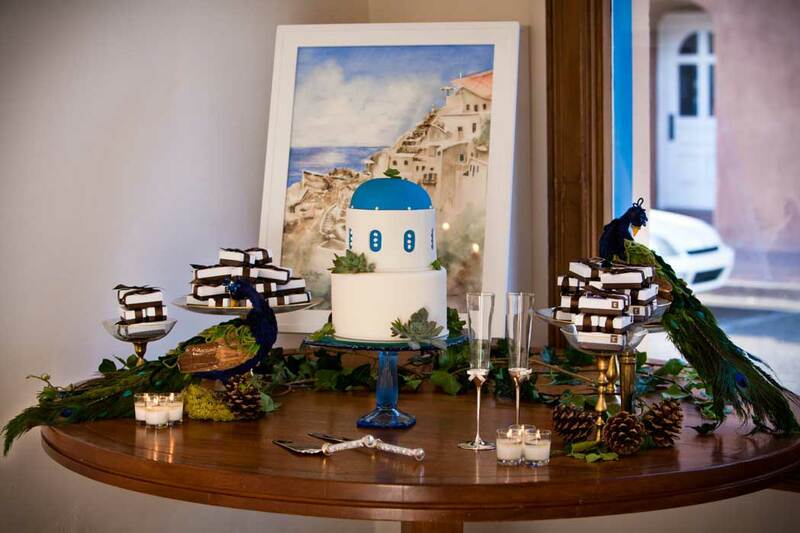 The cake was not only an homage to Kosta’s Greek heritage, but it signified the very Church where Kosta proposed to Maggie. They even had a family friend create a beautiful watercolor of the special spot which also graced the cake table. 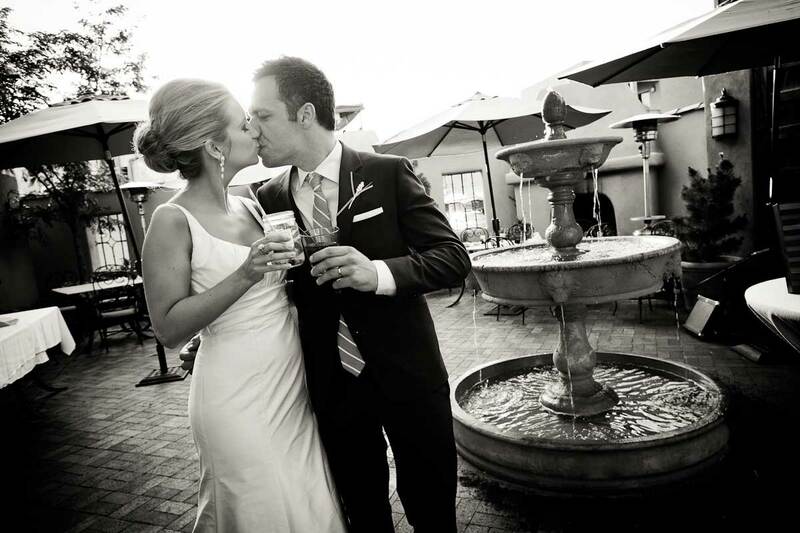 10 months prior, Maggie and I were brainstorming and cooking up plans for a beautiful wedding. After all of our hard work and thoughtful design it was a pleasure to see a beautiful reception filled with smiles, laughter, great food, fabulous desserts and even some Greek dancing! 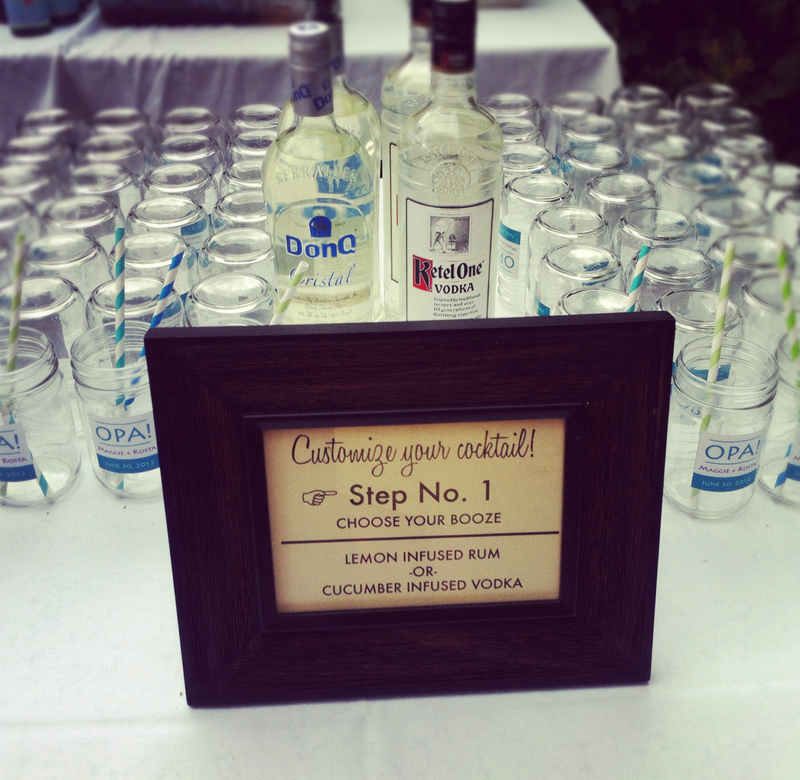 We decided to take the signature drink to a whole new level. We worked with Hotel St. Francis’s very own Santa Fe Barman, Chris Milligan to create infusions of cucumber vodka and lemon infused rum. 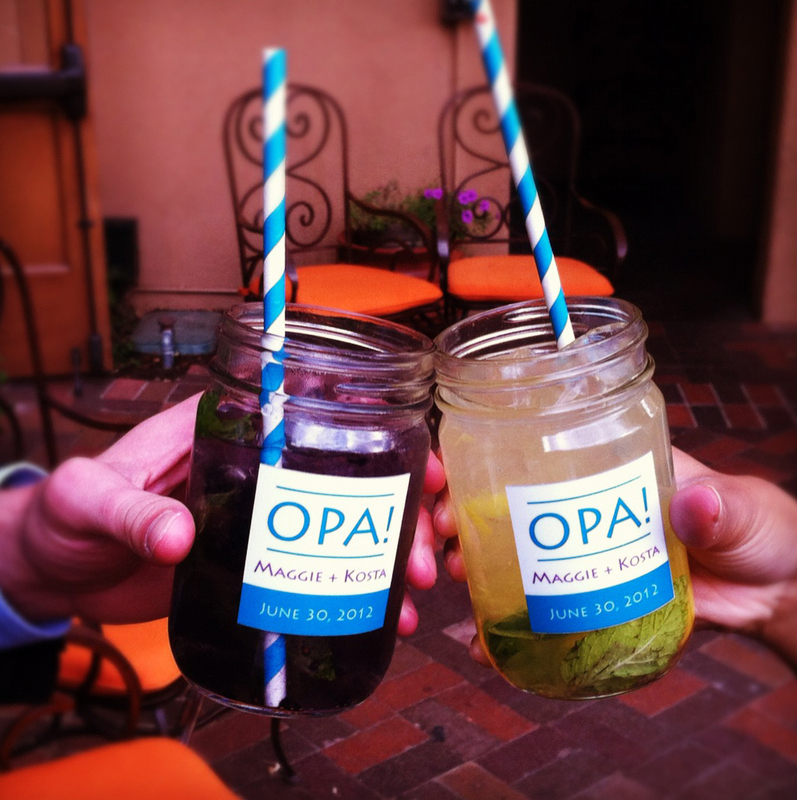 The flavored spirits were pre-poured into customized jars and then guests were invited to choose their own combination of summer berries and fresh herbs to add to their concoction. 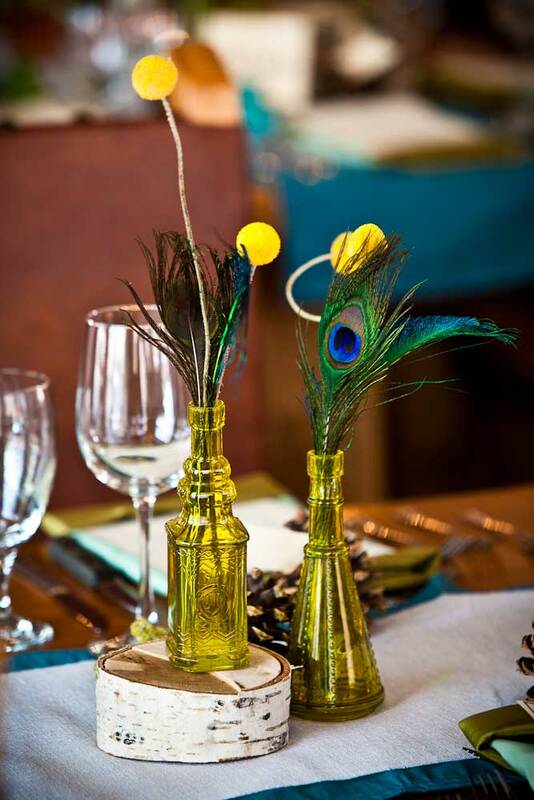 The drinks were topped off with soda and ice, covered with a lid and the guests could shimmy and shake their very own cocktails! First and last photos courtesy of Ginger Russell Photography. Middle photos via the Hitching Post Instagram Feed.